THERE WILL BE 1000 PASSES FOR SALE AT THE GATES! We’ve been looking all over for you. Are you ready to RAVE TO SURVIVE? - Dance ’til you drop at 3 full-powered stages blasting EDM, TRANCE, TRAP, TECHNO, HARDSTYLE by international Audiomancers and supported by regional acts. - Get immersed and take thrilling choices as you journey with your friends through the cinematic world of Dropzone. Where will your decisions take you? - Grab your squad and tackle the zones of the fortress including The Arcade, The Bazaar, The Arena, and The Recovery Bay! - Choose from Silver, Gold, Gold Table and Diamond Passes, each with unique perks for you and your fellow soldiers to enjoy. -Join the movement by adding a Dropzone symbol to your photo with the Dropzone Festival application! May the music and lights guide you. Stay safe! Blast all those bad vibes away at the fortress’s grand generator with Audiomancers such as Kaskade, Paul van Dyk, Liquid Soul, Futuristic Polar Bears, and plenty more to be announced! Step aboard and experience a mass of soul-pounding beats by regional artists and international headliners including Sven Väth, Pan-Pot, and more to be announced! Our weapons platform is equipped with the dirtiest drops the galaxy has ever experienced! Party hard with A-Trak, Dirtcaps, and more insane Audiomancers to be announced! Grab your friends and discover the fortress’s recreational zone, featuring a mesmerising 360 Dome, virtual reality painting studio, interactive photo options presented by Instaroid and Pro-Toys, and more content from major entertainment studios! Be at the battlefront by entering the training arena with your squad! Compete in exhilarating lazer games with fellow soldiers, brought to you by LAZGAM. Roger that? Get sparring! Need some down-time to power back up? Head over to the Bay, soldier! Enjoy daybeds, food, beverages, and massages amongst cool mist in this soothing area. We all need some fuel to get back into the fight! Visit the neon-lit Bazaar to grab some scrumptious food and refreshing drinks, and browse some art and other knick-knacks along the way! You’ve been out in the heat enough, survivors. Come into the fortress and take in some of our Magic Mist, straight from the major festival scenes of Europe! Bask in the cool mist amongst beautiful neon lights as you party the day away, who could ask for more? Get ready for an all-new electronic music experience that will throw you and your friends straight into the heart of a post-apocalyptic battle between human-kind and savage creatures from another galaxy. What role will you play to save our world? 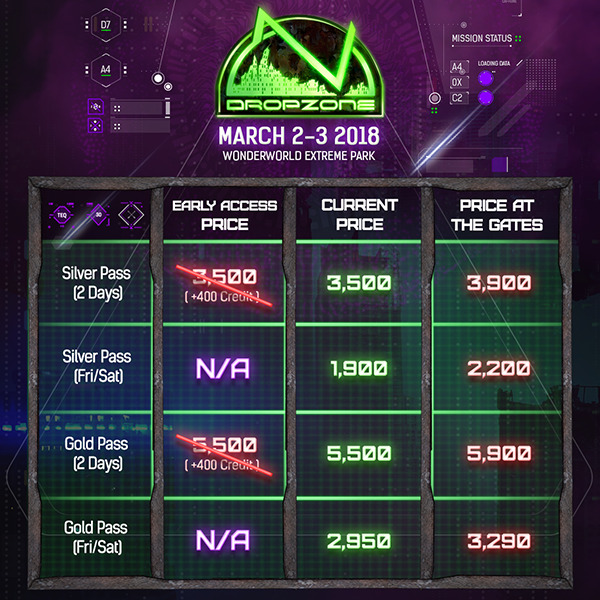 มาร่วมกันสร้างปรากฏการณ์ความมันส์สุดขั้วในเทศกาลดนตรี Dropzone Festival เพราะหนทางเดียวที่จะทำให้พวกเราอยู่รอดได้คือ ปาร์ตี้ ปาร์ตี้ ปาร์ตี้เท่านั้น! - จับมือเพื่อนๆ ผู้อยู่รอดทั้งหลายของคุณไปสนุกกันในโซนต่าง เช่น The Arcade, The Bazaar, The Arena และ The Recovery Bay! - ร่วมกันค้นหาเพื่อนผู้รอดชีวิตคนอื่นๆ โดยการใส่สัญลักษณ์ดรอปโซนเข้าไปในรูปของคุณ ด้วยแอพพลิเคชั่น Dropzone Festival! เอาให้สุดกันไปเลยที่เวที เจนเนอเรเตอร์แสงและสีที่มีชื่อว่า The Core กับ Audiomancer อย่าง Kaskade, Paul van Dyk, Liquid Soul, Futuristic Polar Bears และอีกหลายๆ ชื่อที่จะทำให้คุณมันส์อย่างเต็มที่ รอดูกันในเวลาอีกไม่นาน มีของดีมาแน่! เวทีอาวุธลับ The Armory ก็จะมีทั้ง bass ทั้ง drop หนักๆ สำหรับทหารสาย turnt ของเรา มาพบกับ A-Trak, Dirtcaps และ Audiomancers ที่จะมาเปิดเผยตัวตนกันในอีกไม่ช้า รอลุ้นกันเลย! มันส์กับเวทียังไม่พอ เรามาเล่นเกมส์ lazer ในสนามฝึก The Arena กันดีกว่า! จับทีมกับเพื่อนๆ เพื่อมาแข่งกับทหารคนอื่นๆเพื่อให้รู้กันไปเลยว่าใครมีสกิลการต่อสู้ที่เจ๋งที่สุด เราจะไม่ยอมแพ้โดยเด็ดขาด เริ่มซ้อมกันได้เลย ทหาร! ปาร์ตี้เพื่อมนุษยชาติทั้งวันก็เหนื่อยเหมือนกันนะ แวะมาพักที่ The Bay กัน มีที่นั่งเล่น นอนเล่นชิลๆ กิน ดื่ม นวด ท่ามกลางมิสต์สวยๆเย็นๆ พอ HP bar เต็มค่อยออกไปสู้ต่อ! อยู่ข้างนอกในภัยอันตรายและความร้อนมานาน ผู้อยู่รอดทุกๆคนคงจะต้องการบรรยากาศสบายๆเมื่อเข้ามาข้างใน Dropzone fortress ที่เต็มไปด้วย Magic Mist ส่งตรงจากเฟสติวัลใหญ่ๆ จากยุโรปที่จะนำความเย็นและสวยของไอน้ําชนิดไมโครมาให้พวกเราปาร์ตี้ทั้งวันทั้งคืนใด้คล่องแคล่วขึ้นในอากาศประเทศไทย! Meet the official lieutenants of Dropzone Festival Bangkok 2018!